If Popeye were around today he wouldn’t be gobbling down spinach at all. Knowing what we know now about kale’s nutritional power, Popeye would surely be ingesting kale. Who knew? Years ago I used to take meals in a certain restaurant where every plate they served had this curly green thing as garnish. When I asked what it was, no one knew- until they read the box. Now we know that kale is probably the healthiest green vegetable there is, chock full of vitamins, minerals, phytochemicals etc etc. 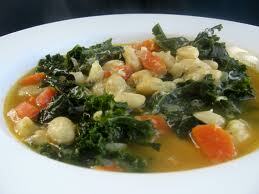 But forget about all that, kale tastes great and in this soup, exemplifies a wonderful flavour. · Cover beans with water by 2 inches in a pot and bring to a boil. Remove from heat and let stand, uncovered, 1 hour OR INSTEAD soak overnight in water to cover. Drain beans in a colander and rinse. · Cook onions in oil in an 8-quart pot over moderately low heat, stirring occasionally, until softened, 4 to 5 minutes. · Add garlic and cook, stirring, 1 minute. · Simmer, uncovered, until beans are just tender, about 50 minutes. · While soup is simmering, brown sausage (if using) in batches in a heavy skillet over moderate heat, turning, then transfer to paper towels to drain. · Stir carrots into soup and simmer 5 minutes. · Stir in kale, sausage, and remaining quart water and simmer, uncovered, stirring occasionally, until kale is tender, about 15 minutes. · Season soup with salt and pepper. Kale and white bean soup is best if made 1 or 2 days ahead. Cool completely, uncovered, then store in icebox covered. When you reheat it, thin with water if necessary. This is a fine soup. Great recipe. I'm always on the lookout for recipes for Kale. Thanks for this one. While growing up in MD, my family ate kale often, but when my husband and I moved to GA in '71, the only place I saw it hereabouts was as decoration at the meat and seafood counters at the grocery story, or as garnish in a restaurant. It's wonderful to be able to find it so readily in our local markets now, and your recipe sounds super. Count me in as your newest follower. HORST PETERS: This is a great use of kale. KALYANI: Thank You for calling,and thanks for the substitution suggestions. MISHA GERICKE: I'm happy to hear you like it, Thanks for calling. Hope your ook is coming along fine. LADYDRAGONFLY: You are absolutely correct. Thank You. Are you putting all these soup recipes into a book? You should. I absolutely love all of these. POONAM BORKAR: Thanks, it really is. SUSAN FLETT SWIDERSKI: I see kale in the Ingles supermarkets in north Ga. I even like it raw. LYNN PROCTOR: Thanks Lynn it is. SUSAN OLOIER: I'll have to get around to it, kinda busy time-wise. But I'm glad you like them, Thank You. Kathy Stemke's New Book Release: SH SH SH LET THE BABY SLEEP! When Zachary puts on his thick black glasses, he becomes a super hero. This enables him to protect his new baby sister from all kinds of problems. In the process he learns how much he loves her. This action-packed book with clever rhymes focuses on teaching consonant blends. The teacher supplement includes comprehension questions, songs, worksheets and activities. This book in print is also at B&N.com, Target.com, Borders.com & Amazon.com and other online bookstores. Sign up: free Monthly Movement and Rhythm Newsletter!